Lexicolatry: What Happened to the Dodo? I've never - but NEVER - heard that name in my entire life. And I have no knowledge of a "simpleton" which is "simplório" in Portuguese or "fool" which would be "tolo or (ou) idiota" to being called dodo. Ever. In any region of Portugal. So no added lexical insult for Dodo in Portuguese language. And the word doudo isn't used anymore. The U was replaced by I many centuries ago. Which turned doudo into "doido" which is used to call someone crazy, nuts... I can see doudo caming from Dodo though; we didn't send overseas the brightest of the pack and being an easy prey that wouldn't fly but waddle around the bird might have looked crazy/doudo (back then). But like I said never heard the noun or heard/read the expression "dead as a dodo" or "gone the way of the dodo"
According to the OED, dodo comes from the Portuguese duodo, meaning simpleton or fool, but this would of course be from the Portuguese of the 16th / 17th century. 'Dead as a dodo' and 'gone the way of the dodo' are definitely English expressions, although there might of course be variations in other languages too. 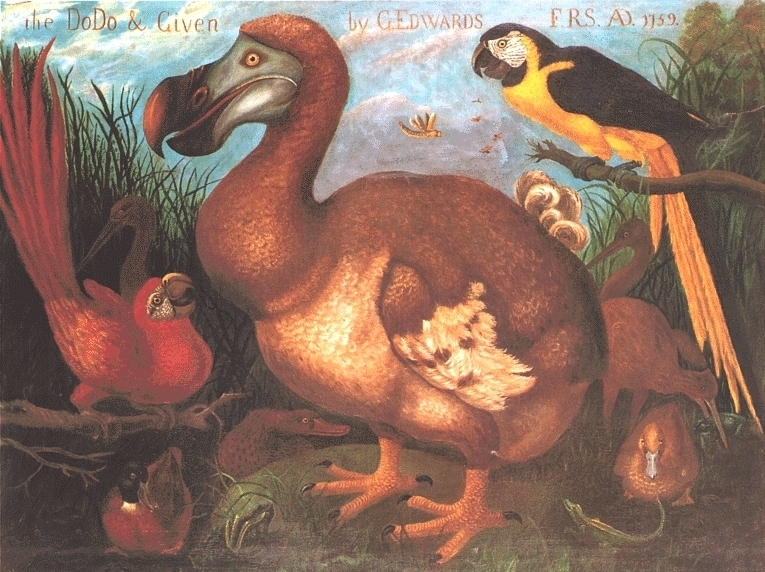 I think originally the dodo was referred to as "pássaro doudo" "crazy bird" in old Portuguese. Because I had heard different things regarding its etymology, I checked a number of sources when writing this post, including Chambers, Collins, Merriam-Webster and the Online Etymology Dictionary, and all were in agreement with regards dodo's original meaning. I could see 'crazy' being used as a synonym for 'simple' or 'stupid', as it was apparently so easy to kill. Wasn't Dodo the nickname of Lewis Carroll (real name Charles Dodgson) of Alice in Wonderland fame? I think English dodos are endearingly ineffectual, as well as dead (for now, anyway: isn't someone trying to breed a new dodo, starting from some sort of a pigeon? I do hope so!). Are they!? I had no idea. Although it could only be some selectively bred likeness of a dodo, couldn't it? I think the only specimens left are a desiccated head and foot in the Oxford Museum of Natural History.